The baselayer of the future. 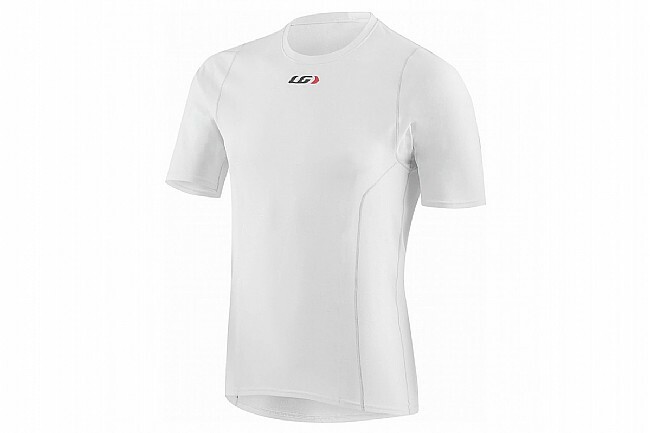 Sporting a lightweight, minimal construction, the 3002 Tech Tee from Louis Garneau is a versatile baselayer for those warmer months. Designed to offer the minimal amount of warmth with outstanding moisture wicking and breathability, this tech tee sports Drytex® 3002 fabric. This stretch knit with a slightly brushed interior allows the formulation of a thick layer of air to maintain body heat while still offering great moisture control. Microporous fibers in the fabric allow for the effective release of moisture, while the silver-based permanent treatment provides antibacterial and anti-odor properties. This base layer works great helps keep warm in the cool morning (40s 50s) and cool when it warms up. I ride in Northern California where it could start out at 42 degrees and after a three hour ride be mid 70s. This covers it all very well. I have another similar LG tee which is a bit too tight but this one is great - sized right and feels good on. I haven't been out with it in really cold weather yet, but in cool weather it works well. And oh so comfy!